Has your bedroom become a storage unit where old furniture and boxes full of things that need to be sorted (or thrown out) compete for space with dirty dishes, kid's toys and unfolded laundry? Is the wastebasket overflowing? Is there a pile of stuff on the night table that keeps tumbling onto the rug? Are there books and shoes tangled up in the sheets? Can you see the floor? The intimate space you share with your spouse needs to be welcoming and relaxing. Chaos, debris, and suspicious odors do not promote romantic feelings. In a hurry? About.com explains how you can make a huge difference in just 15 minutes with a quick cleanup. This will remove the obvious clutter, eliminate tripping hazards, and create the illusion of organization. When you're ready to invest a little more time, go for the intense master bedroom cleanup. The authors estimate this will take one or two hours, but they probably have superpowers. I would expect this to take at least four hours, and I'd allow some extra time for a snack break. 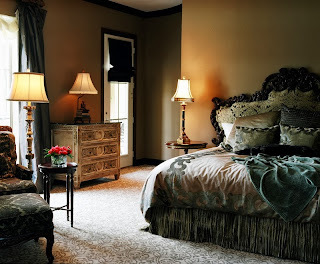 A relatively small investment of time and energy will make a tremendous difference in the way the bedroom looks and feels, and that will make a huge improvement in the way you and your sweetheart feel when you are there. Give it a try! Rosemary, I'm not married so following you wouldn't make much sense. That's okay - I don't worry too much about who does or doesn't follow me. Still, I'd like to think that some of the things I write about apply to human relationships in general and so might be of interest to a wider audience. In any case, thanks for stopping by and commenting! Yeah man. The lean clean works every time. Lately, we've gotten into taking the extra step and throwing the junk out too, then it does not turn up at a later date to be dealt with once more. Have a goofy one!